Our Bondwasher® has been Approved by AT&T and ERICSSON. The washers you choose and your installation methods may be causing the very corrosion you are trying to avoid! Our Bondwasher® is one continuous piece, not two separate washers with gaps between them. Using a stainless 3/8-16 bolt and nut, the correct amount of torque you should apply to the nut is about 22 foot-pounds. This results in about 3,600 pounds of clamping force under each nut, or 7,200 pounds of force between ground lug and ground bar! This clamping force is spread evenly by the Bondwasher® to the ground lug, resulting in a uniform gas-tight seal between the lug and bar. This uniform clamping force promotes an intimate electrical connection, resulting in the lowest possible resistance.This clamping force also helps reduce the chances of passive intermodulation (PIM) at the lug and bar interface. 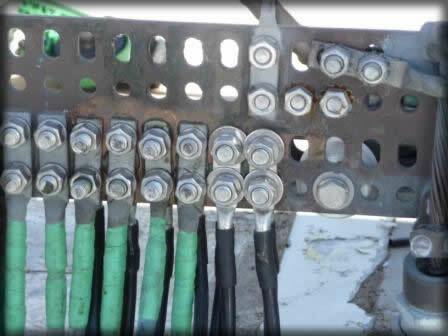 In the grounding world, low resistance and a gas-tight seal are the conditions you need to prevent corrosion between lug and bar, resulting in the best electrical connection! 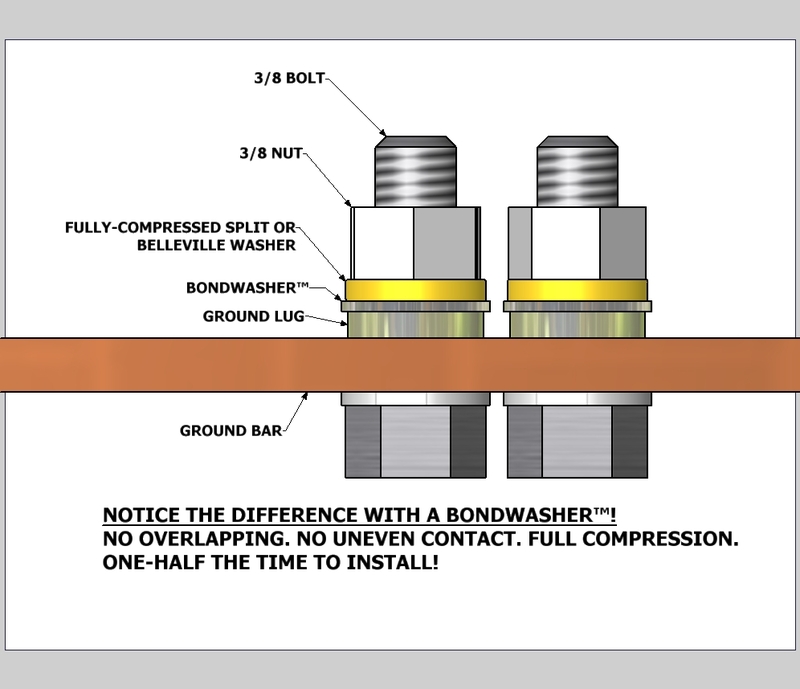 Bondwasher® in your electrical bonding installations results in a gas-tight seal between lug and bar. If you are using large flat washers, you may be grinding flats on the sides in order to fit two lugs side-by-side on the bar. After all, you want to use every set of holes on that expensive bar. Well, that grinding wheel you used was used previously to grind some copper, steel, iron, and/or aluminum. The particles of material from those earlier grindings now have been embedded into the sides of your flat washers to form contaminating particles, degrading your carefully-installed bond installation. Or, you may be using the large washers without grinding flats. This means you are either stacking washers on adjacent lugs, or you are wasting ground bar space by skipping holes. If you have found some flat washers with a smaller diameter, you still can have a stacking issue between adjacent lugs. Any time you stack washers like this, you will end up having a form of corrosion called “crevice corrosion”. This type of corrosion is inevitable when the washers don’t seat completely flat or leave small gaps, even though you have applied proper torque. If you use washers that are smaller in diameter to avoid stacking, are they so small that the split washer is larger than the flat washer? 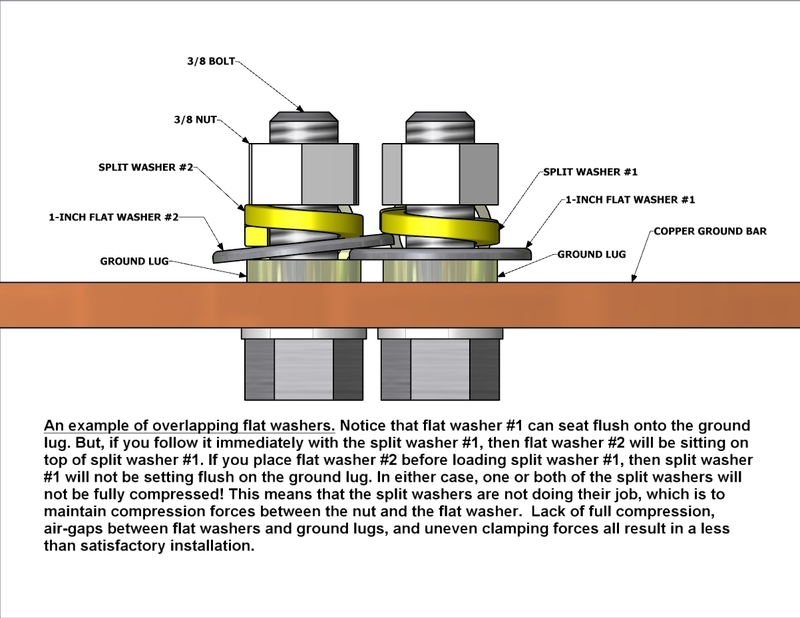 If so, you aren’t getting the full compression of the split washer against the flat washer! If you use no flat washers, the split washer is falling into the slotted hole of the ground lug! Some providers require a flat washer under the head of the bolt as well as under every split washer. Proper installation procedure dictates that you never place just a split washer under the nut. The reason? Ground lugs that have elongated or over-sized holes will allow the split portion of the lock washer to fall into the slot, and this reduces the surface area under compression at the bar, thereby resulting in a weaker joint, mechanically as well as electrically. In spite of all the admonitions, guidelines, and suggestions, we still see installations in the field that have stacked washers, missing flat washers, split washers that fall into the slot of the ground lug. We also see washers that are not American-made, and are of questionable material composition. The picture at the right is an example of many mistakes that we see in the field far too often. We at Ingenuity Industries Inc. hope you will consider specifying our Bondwasher® any time you connect to the ground bar! INGENUITY INDUSTRIES INC, the manufacturer of Bondwasher® guarantees that every Bondwasher® is made of 300-series stainless steel, that is produced in conformance with DFARS (Defense Federal Acquisition Regulation Supplement). It takes less time to install one Bondwasher® than two individual flat washers. Try a sample of the Bondwasher® product by giving us a call! If you have need of a product with different specifications, call us. For sales or technical questions, call our office at 530-933-1522.